All Bay Area counties: Santa Clara, San Mateo, San Francisco, Marin, Contra Costa & Alameda Counties. 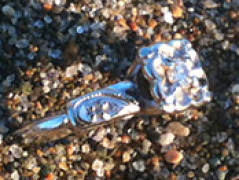 We've recovered rings in Mill Valley, San Anselmo and Stinson Beach in Marin County; San Francisco parks and beaches; San Jose, Santa Clara, Campbell, Los Gatos and Sunnyvale in Santa Clara County. We will donate 20% of any reward offered to the Susan G. Komen Breast Cancer Foundation (www.komen.org). I have detected up and down California for several years, plus Florida and Hawaii. I have successfully recovered rings of every description (silver, gold, platinum and titanium), watches, necklaces, coins and every kind of relic you can think of. I have even been called out to find parts of an expensive RC helicopter that were lost in a crash (I found them). 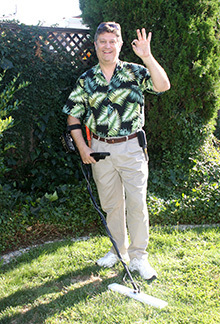 I have the latest metal detecting equipment, and know how to use it. 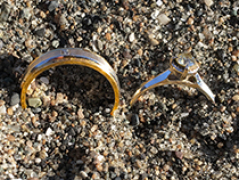 If you have lost a precious piece of jewelry or other metal item, contact me today. Dave is my angel!!! He knows that, I’ve told him several times. He literally made us cry when he opened his palm and showed us the rings. I never thought I will be able to go home and felt complete. I lost hope coz the rings were gone for 2 weeks in a public area where hundreds or thousands of people go everyday. 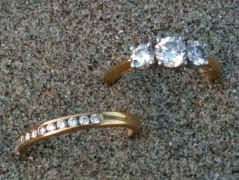 Loosing my two most important jewelries was really heart breaking, all I could think of everyday were my rings if they were still there or somebody found them. I kept on calling the golden gate lost and found every single day. 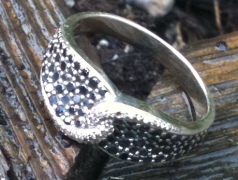 I looked for possible ways and read blogs and reviews on how to find lost rings. Luckily, I found Dave on the ring finders, I didn’t know they exist. He is really patient and works professionally. I’ve met him once but I can tell that he is a very nice guy, not only because he found my rings but you can feel his genuine intention to help. He found the rings in less than 40 mins., he is really an expert. I highly recommend him.I will forever be grateful Dave! Thank you so much! This means a lot to me! Thank you again, so much. My family was also blown away that you found it. I think it is so awesome that you are able to share your hobby with your daughter, and she can experience a selfless way of making people happy. Quick story of why my ring is so important to me. My parents always had very simple gold bands as wedding rings. My dad never took his off. I was pretty young when it was at a point that he could not get it off anymore, and it was just a few years ago that after wearing it for 30 + years that he finally had to cut it off. I think that now I have worn my ring for 10 years. I was wearing it when my kids were born, when they took there first steps, the first stitches, when I taught them to ride a bike, the first day of school. And now I will be wearing it for all the "firsts" yet to come. I was afraid I would never see my rings again so, of course, we were ecstatic when Eryn located them within10 minutes of beginning the search. Almost as nice, however, was meeting Dave and his charming daughter, Eryn. They could not have been more pleasant or helpful. From our first conversation, Dave gave me hope that if I could identify the area where I lost my rings, there was a good chance they could find them. Fortunately, I was able to do that and Eryn was a miracle worker. They are lovely people who really came to my rescue. I was so sad when I cam back from San Francisco on Monday. It felt like a part of me had gone missing. All I could think about was the ring and how desperately I was trying to search for it. After three days of mourning, I was trying to look up some tips regarding how to search sand (for future accidents) and i came across this website -TheRingFinders.com. I read the blogs/stories on how they had helped with a number of searches and decided to contact them. I was not too hopeful because three days had passed but I still wanted to give it a last try. So on Thursday midnight I mailed them the details. Chris contacted me the next day and helped me get in touch with Dave. It is only because of Dave’s experience and my friend Navdeep’s precise directions that I have my ring back. I can’t explain how happy and excited I am. I am glad that I contacted The Ring Finders. I am so grateful to Chris and Dave for the service and for making this possible; and a very special thanks to Navdeep for being there. Dave! I am just so incredibly excited that I woke up that morning back in Austin and knew that THERE HAD TO BE SOMEONE who would be able to find my Grandmama’s ring. I could not be more ecstatic and as soon as fedex delivers the ring to my hot little hands, I will take a picture of it back where it is going to stay – on my hand! Sarah and Liam had such a great time with you and your daughter and I know it’s an experience that I will always remember. So many friends here have already heard the story and I cannot thank you enough. I’m so glad my husband contacted The Ring Finders! I must admit, I was dubious at first. I had an idea where the ring might have slipped off, and had dug up all the plants I had just put in–several times! We even rented a metal detector ourselves, and Wayne, myself and a friend of ours had all taken turns at running the detector along the street side planting bed–the very place that Dave and his daughter found my ring! How did they find it when we didn’t? Dave explained how it isn’t just having the equipment, but the experience that counts. Dave’s daughter is so adorable! You can tell how much she loves helping her Dad out–or is it the other way around? She got right in there! Of course, it started to rain–and she was getting soaked. But when she found the ring–her eyes were shining–she was as excited and overjoyed as I was, if that’s possible. What a lovely father and daughter team! And they say, it’s a hobby rather than a job. Good humoured, patient, if they can’t find it–it’s not there! And you pay what you can afford–in turn, Dave donates 20% to the Susan G. Komen Breast Cancer Foundation. Thank you so much! Go Ring Finders!!!! Dave and Eryn Millman were two of the kindest, most generous, and professional people I have met. 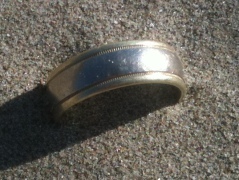 Dave saw that I was inquiring for anyone with a metal detector– because I had lost my watch in the sand at Baker Beach. He emailed me in a friendly and professional manner– we corresponded and ended up talking on the phone. Dave knew exactly what to do in the case of a lost metal valuable! He explained that there are certain initial questions that we must ask– steps to take that I would never think of– but I learned were key in retrieving my sentimental and pricy Cartier watch! These included questions about the weather, the proximity to the water, etc. He even looked up the time of the tide for me that evening online while over the phone. Extremely competent sounding and I immediately felt relieved. I knew I was talking to the right team of people since the start of the phone chat. Dave told me that he and Eryn had a job in Marin on Sunday morning, and said that they could meet me at Baker Beach in the afternoon. Dave and Eryn showed up when they said they would– despite the less-than-great conditions (it was raining and pretty cold that day). Dave had told me on the phone to retrace my steps to where I lost it– and I did just that, (with my friend Madeleine, who I was with the night on the beach). Dave and Eryn each had metal detector– which I soon saw were more complicated than I thought! The two of them greeted me smiling, very warm and kind while being extremely professional and work-ready. Dave and Eryn set up boundaries– making a frame based on the spot that I had decided I had left my items that night. They talked calmly to one another– as I sat on and watched with Madeleine. Dave and Eryn had a system so that every area would be covered. Soon beeps started going off– though the first few times they went off they were just scrap metal or bottle caps. Each time the sound went off, they had the skills and tools to gently dig and sift through the sand to find the metal. The beep went off– and at the time I was watching Dave work. But I heard my friend let out a scream of joy and I turned to see Eryn holding the watch! Joy does not begin to describe how I felt! I immediately jumped up and gave Eryn a huge hug! I believe I may have jumped up and down once or twice. 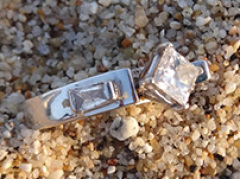 Definitely lots of squealing and “Oh my gosh’s!” I could not believe that on the entire beach Eryn narrowed in on the small space where the watch had settled! Amazing. And– the whole time from when we met them to when the watch was found was no longer than twenty minutes!! The watch meant so much to me, as I got it for my “Sweet Sixteen!” And it was an expensive piece, a gift I could never afford to buy myself again.